Here you can personalise a birthday party with the birthday boy or girls own interests and Wayne will attempt to include them into your party. This is the personalisation page, it's only for people that have already booked me. The idea is that if I can add some personal touches to the party then it will be even better and more memorable. So if you let me know you are having a Frozen party then I can make sure I bring my snow machines, play more frozen music or if your little one likes teenage mutant ninja turtles then I can make sure that I play a game featuring them or make a Ninja Turtle balloon for the birthday child. You get the idea, just fill in as many details as you like below. I will then add the details onto your booking confirmation. This is the reference at the top of your booking, three letters followed by three numbers, like ABC001. You can choose a character to see in the show, maybe you've seen one before and would like to see them again or there is one you have not seen yet but would like to see. Find out more about the characters at the bottom of this page. Let me know if they have any songs they are really loving at the moment and I can make sure they are played at some point in the party. Thank you! I will e-mail you shortly your amended booking confirmation with the personalised elements added to the booking. 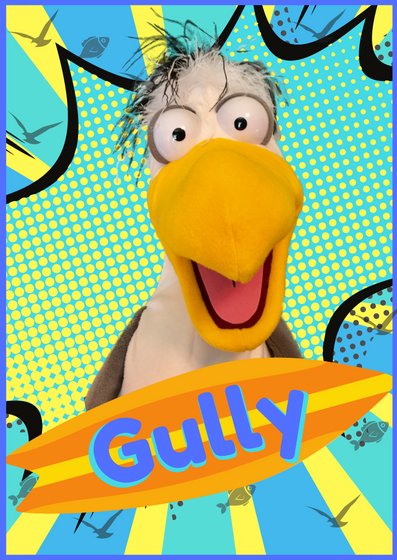 Gully Joined the cast in 2018, he is the worlds only Surfboarding Seagull. Sometimes selfish always funny this is a bird of many talents. He's a must see at every show. Dazzle is another new cast member, as smart as she is cute, she has the voice of an angel but watch out for that horn! Ferris joined the cast in 2009 and wow did he join with a bang! Ferris is only suitable for audience's of 5 year olds and above. Ferris is fully interactive in the shows and he WILL join the audience for some crazy fun and he may even get them wet too! Bam is the longest serving cast member. He's a wild animal however he doesn't believe in magic but he will do anything for a BANANA! Joining the show for Halloween in 2016, he's the friendliest zombie you'll ever meet but don't let that fool you. He has some surprises up his sleeve for you too! 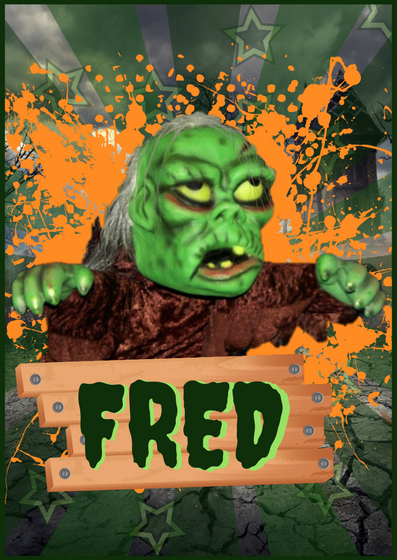 Fred only normally joins the show in October every year. Sometimes there may be unforeseen circumstances which stop me from adding personalised elements so nothing is a guarantee but I always do my best to make the shows the best they can be.